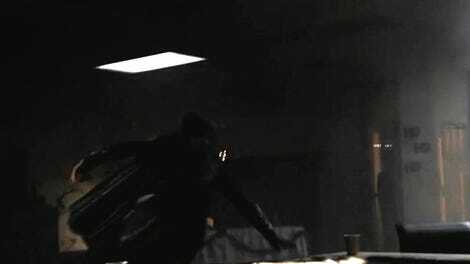 Mon-El (Chris Wood) and Supergirl (Melissa Benoist) rockin’ some cloaks. Supergirl has had a lot of origins over the years. There was that time she was an organic matrix of goo that only chose the Supergirl form so she could make out with her boyfriend, an alarmingly hirsute Lex Luthor. And there was that time she was genetically engineered to protect Earth and be cooler, faster, and stronger than her cousin. She’s come from the future. She’s come from a wish. She’s been Lois Lane and she’s been a queen of a fictional Latin American country. But through all her incarnations in comics, TV, and film two things have slowly become consistent: Supergirl is always Superman’s cousin, and she’s always come from a city that actually survived the destruction of Krypton. I don’t think it’s a spoiler to say Argo City is alive and well, but there’s the spoiler bar anyways. 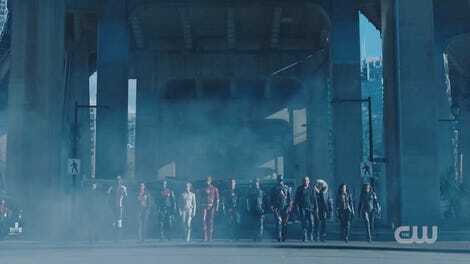 After all, the CW showed the damn city off in every trailer from last week. Yet in case you missed it, yes, Kara’s hometown survived the destruction of Krypton, and while her dad, aunt, and uncle are all dead, her mother, and a whole lot of other Kryptonians in love with stilted line delivery, are very much alive. In retrospect, it’s silly we didn’t see this coming from the beginning of this season. First the role of Kara’s mom Alura was recast (trading Laura Benanti for Smallville’s Erica Durance). Then Kara spent a huge chunk of the season moping about being lonely and tired and worried she could never have a “normal” life. We all have assumed the big bad of the season is Reign, a Kryptonian worldkiller, when now it looks like it might be Kara’s own homesickness (and Reign’s culty Kryptonian handlers). That is a city stuck on a whole mess of kryptonite so... shouldn’t Kara have been feeling it? This, in many ways, is an adaptation of Supergirl’s most iconic arc. She doesn’t have the same catalogue of big stories that Batman or even the Flash or Superman have. There’s no Death of Supergirl or Flashpoint to draw inspiration from. Supergirl’s big story has always been the temptation of going home because in nearly every medium some small part of her world survives and her family is there and waiting for her to finish her derring-do’s on Earth. What remains to be seen is what version of Argo City the CW’s Supergirl will explore. Will it be a totally average Kryptonian city transported to an asteroid? Or a creepy cult town of world-killer worshippers (we know at least one head honcho for the city is feeling the Reign)? Or maybe it will go the route of a city full of secret robots twisted by one mad scientist’s need to save his culture. Clearly the show wants us to think it is a normal town. There’s a nice little bazaar where people are chill, watching folks wander around in capes, and there are both robot and Kryptonian police forces, and friendly Tuvok from Star Trek: Voyager is on hand rocking the hell out of some robes. But also... Argo City is a little off, right? Like, we can all agree the people of this town are weird? Kara and her mom see each other for the first time in 15 years and they speak English, hug, and then immediately get to trying to secure Kara some MacGuffin space rock. I am happy Kara has her mom back, but also it seems Kryptonians are pretty trash at expressing themselves... or they’re zombie slaves to a MacGuffin rock. I can’t be sure. Maybe both! Whatever is going on with Alura Zor-El results in what should be the most affecting reunion of the show being a hot rushed mess at the center of an overpacked episode instead. 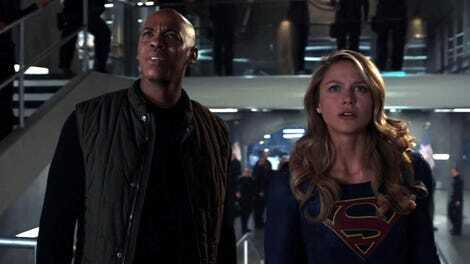 There are at least five different storylines all trying to compete with Kara’s family reunion: The aforementioned MacGuffin rock, Lena’s struggles on whether or not to murder her friend Sam, Winn’s bonding with Sam’s kid over having murder parents, Mon-El having lots of “I AM FROM THE FUTURE” feels in an Argo City that feels vaguely dystopian once you get past the abundance of flowing fabrics, and Alex hunting down an old foe out to murder her. A lot of these plots could have been fun given enough room, but all slammed together into a hot mess they left me wanting to punch the brakes. Supergirl is best when it takes a moment from plot! and fan service! and lets the story breathe, allowing its strong cast to anchor some admittedly outrageous storylines. 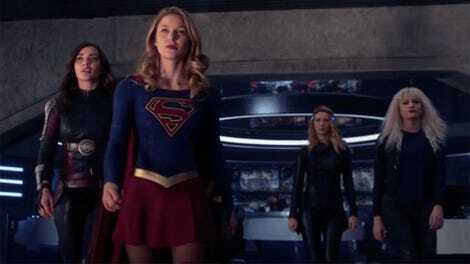 At least it looks like we haven’t seen the last of Kara’s reunion. While she gets the MacGuffin rock and heads back to earth, it’s made clear the Kryptonian cult in Argo City will continue to be an issue, and the trailer for next week suggests Kara’s going to be taking a sabbatical to visit her hometown.... which I’m really hoping is full of zombie slaves. Mother (Erica Durance)-daughter bonding time. Kara’s disguise snuggie looked very comfortable. 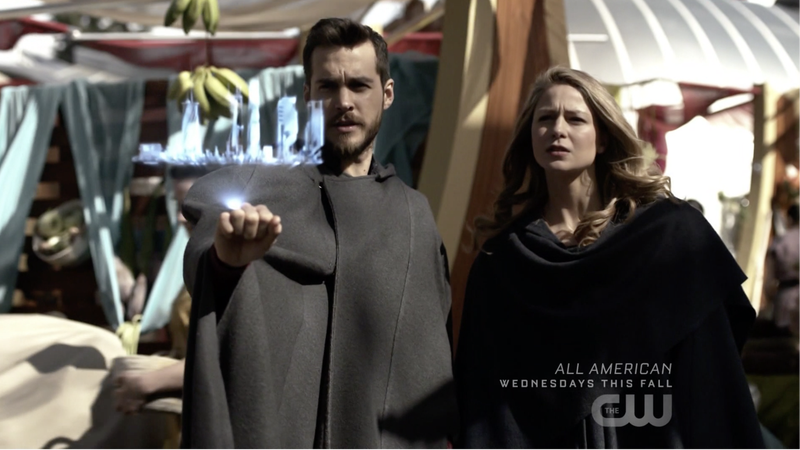 Why does every Kryptonian have the little heraldry shields on their robes except the first ones Kara and Mon-El meet in the bazaar? Also apparently the Kryptonians in the bazaar all recognized Kara and watched her steal robes and still just... did nothing? No wonder their world blew up, they are really bad at being proactive. Alex’s plot was a lot of fun, especially when she defied physics to show how badass she was, but it also made J’onn the most ineffective Martian Manhunter ever. A guy who flies couldn’t keep up with two people chasing each other across roofs on foot? Look, we get that Alex wants to be a mom and could end up being Ruby’s new mom. Please stop brow-beating us with this story beat. It is very sad Sam is gone and Ruby is mom-less, but also Reign’s eye makeup is on point. Will the Argo City plot be resolved by the end of the season or will it be sticking around as the major arc for season four?